Navajo Lake Marina is your one stop shop for all Navajo Lake adventures! Located on the southern end of the reservoir, in the Pine Site of Navajo Lake State Park, this marina offers guide service, boat rentals, a supply store, restaurant and much more. The friendly staff at Navajo Lake Marina can help you plan a truly adventurous day on the lake. 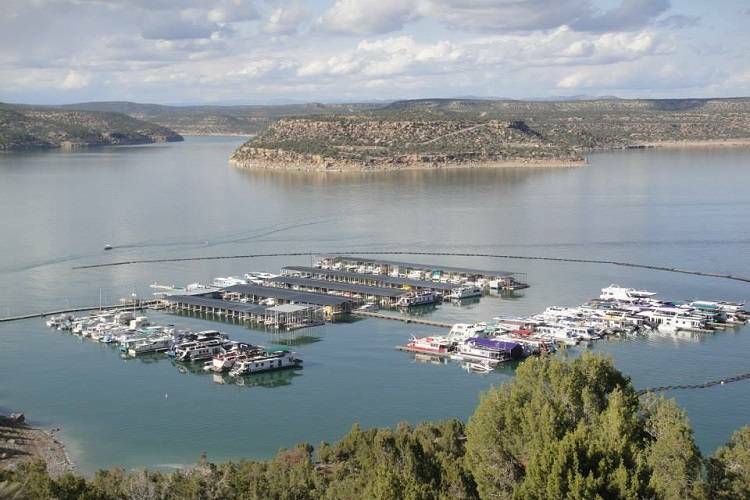 This marina is the hub of activity at Navajo Lake, and the perfect place to begin your stay, be that on water or shore. The staff is knowledgeable and equipped to help you discover what you are looking for, from where the fish are biting to arranging a guide or boat rental. When you visit Navajo Lake you must make tiem for Navajo Lake Marina Bumper Boats! Cool off and cut loose as you splash and bash in these unique tubes. To ride bumper boats you must be at least 8 years of age and 44 inches tall. Children under age and size must ride with an adult. All individuals must wear life vests. 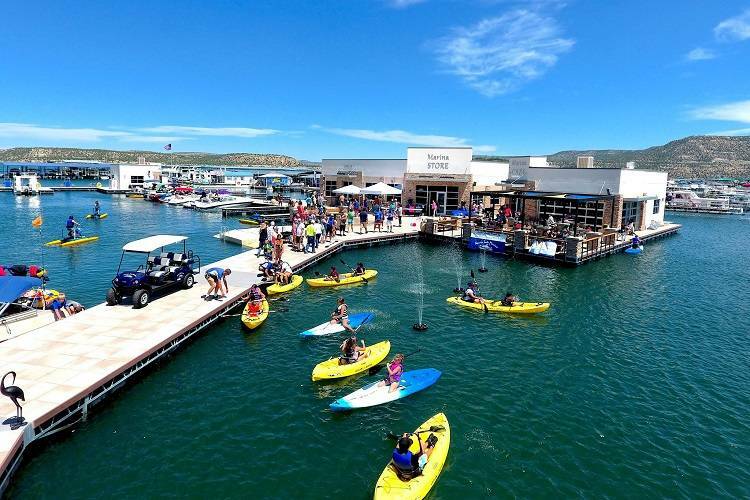 The Navajo Lake Marina bumper boat alley is located at the marina entrance. They are available seasonaly, from March 1 to November 1. 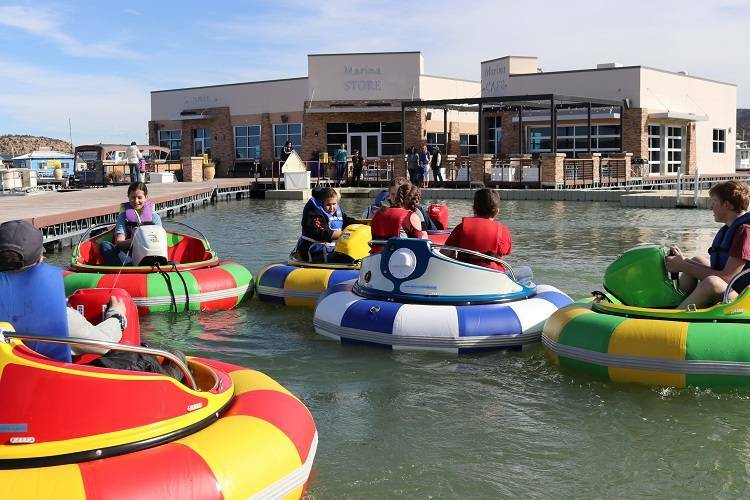 During the summer season bumper boats are available for rent 7 days a week from 8:00 a.m. to 6:00 p.m. Rates are $6 per individual, three rides for $15 and an all day pass for $24.99. Kick start your Navajo Lake fishing adventure by hiring a professional guide. Navajo Lake is a year-round fishery for Bass, Northern Pike, Trout, Salmon, Catfish, Perch, Bluegill, Crappie. Hire a guide for a half or full day lake expedition and learn from the best. Navajo Lake Marina hosts Brue Cafe and the Marina Store to service your needs. Brue Cafe offers the perfect place for an enjoyable meal on the lake, open Thursday - Sunday with extended hours on holiday weekends. The Marina Store carries just about everything you could possible need while visiting the lake - groceries, fuel, fishing tackle and bait, and even safety equipment. The Marina Store is open during every day during the summer months from 8:00 a.m. to 10:00 p.m. Off-season hours are 8:00 a.m. to 5:00 p.m. Call the Marina Store at 505-632-3245 if you have questions.